For more than a decade, Free Planet Radio has been bringing its innovative world-jazz-classical music blend to festivals, concert stages, and classrooms — and now to Diana Wortham Theatre’s stage in a special benefit performance for the theatre’s Y.E.S. (Youth Education Scholarship) Fund, Friday, May 5 at 8:00 p.m.
Diana Wortham Theatre’s Emerging Artists program, now in its second year, is a part of the Y.E.S. Fund and supports young performers by providing scholarships for graduating high school seniors pursuing a career in the performing arts. Due to overwhelming public support of the Y.E.S. Fund, there are four Emerging Artist Fund scholarship winners in 2017. The winners will be showcased during the Free Planet Radio performance on May 5th. Expertly weaving jazz-style improv with the subtleties of Western classical music and Middle Eastern, Indian, and North African rhythms and melodies, Free Planet Radio features two-time Grammy winner Eliot Wadopian on electric and string basses, leaping effortlessly between rhythm and melody; River Guerguerian on an extensive array of global percussion instruments including Middle Eastern frame drums and doumbek, Latin American cajon, and Western drum set; and Chris Rosser on a variety of Indian and Turkish stringed instruments including the 17-stringed Indian dotar, Turkish cumbus oud, guitar, piano, and melodica. 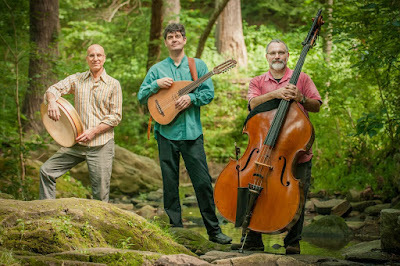 Performing mostly original compositions, the trio always maintains a sense of accessibility, spontaneity, and easy engagement as it mines the depths of world music. These artists emerged from three of the country’s finest conservatories, and each has established himself in concert halls and studios, appearing on over 200 recordings and in 30 countries. Their immense individual talents have garnered worldwide recognition in performances from Carnegie Hall to the Hong Kong World Music Festival; from the Kennedy Center to the Madrid International Jazz Festival. These versatile musicians now unite their expansive talents, instruments, harmonies and rhythms to create a shared world vision; a phenomenal blending and harmony of global traditions in music. About the Youth Education Scholarship (Y.E.S.) Fund: The Y.E.S. Fund supports underserved children by providing tickets to Diana Wortham Theatre’s Matinee Series for Students and Families, the theatre’s school programming series. The Y.E.S. program expanded in 2015 to cover artist workshops in local schools and the Emerging Artists Fund scholarship. Donations to the Y.E.S. Fund and its programs are accepted any time; more information at www.dwtheatre.com/Y-E-S-Fund. About the Annual Y.E.S. Fund Raffle: The 9th annual Y.E.S. Fund Raffle is May 5 & 6 in the lobby of Diana Wortham Theatre. Exciting items like event tickets, jewelry and art, chic apparel, and more may be won while raffle ticket sales support children through DWT’s Y.E.S. Fund. The public is encouraged to purchase raffle tickets either at the box office on these dates between 10am-4pm, or during the Free Planet Radio performance on May 5, or the Susan Werner performance on May 6. Attendance at these performances is not required to participate in the raffle, nor do winners have to be present to win. Different raffle items each day. $5 per ticket, 5 tickets for $20. More information and a full listing of raffle items can be found at www.dwtheatre.com/YES-raffle. Free Planet Radio’s Asheville performance is made possible by Performance Sponsors George & Diana Bilbrey; and by Mainstage Music Series Sponsors Joel & Deborah Bohan Berkowitz, Henry LaBrun, Dianne & David Worley, Omni Grove Park Inn, and Signarama; with additional support by Media Sponsors The Laurel of Asheville, WCQS 88.1 FM and WNCW 88.7 FM.